Leonard Nimoy’s friends, family, and costars reflect on the influence of both the actor and his iconic character Spock. Leonard Nimoy’s son Adam explains his initial idea to create a film focused on the character Mr. Spock as a way of celebrating the impending 50th anniversary of “Star Trek” in 2016. Following Leonard’s death in 2015, Adam refocused his documentary to include a journey of self-discovery regarding his relationship with his father. Leonard Nimoy autobiography narrations introduce Leonard’s early life. Leonard’s older brother Mel and Mel’s wife Sybil fill in details about the family’s Boston roots, and their parents’ initial refusal to support Leonard’s decision to move to California to pursue an acting career. Leonard’s daughter Julie Nimoy also contributes personal recollections. A performance in a 1964 episode of “The Lieutenant,” a series created by Gene Roddenberry, led to Roddenberry pursuing Leonard for a role in his “Star Trek” pilot. Prior to “Star Trek,” Leonard never played any part longer than two weeks. NBC passed on the first pilot for being “too cerebral.” A second pilot was filmed with Leonard as the only actor retained from the first pilot’s cast. Archival interviews and photographs recount the genesis of “Star Trek.” William Shatner offers insight on what made the Kirk/Spock dynamic unique. Jason Alexander, George Takei, Simon Pegg, Karl Urban, and Chris Pine add to analysis of the original series’ three core characters. Childhood friend Barry Newman recalls trying to dissuade Leonard to quit the show. Walter Koenig adds that only Leonard could have played Spock. Filmmaker J.J. Abrams and various fans comment on the appeal of Spock’s character as an outsider. A director note on “The Corbomite Manuever” created the characterization of Spock being more emotionally detached and scientifically minded than humans. Harry Belafonte influenced Spock’s minimal mannerisms. Creation of the Vulcan nerve pinch, mind meld, and hand greeting is also covered. Additional interviewees include screenwriter Nicholas Meyer, “Big Bang Theory” co-creator Bill Prady, and Neil deGrasse Tyson. Spock’s public popularity exploded in the 1960s. Interviewees including writer James Duff, Zoe Saldana, Nichelle Nichols, Mayim Bialik, and Dorothy Fontana discuss the character’s appeal. Leonard rode the wave of popularity by embracing fans, recording albums, and accepting all offers for paid appearances. Initial enthusiasm from immediate family faded as the spotlight grew tiresome and invasive. Leonard moved on to “Mission: Impossible” after “Star Trek” was cancelled. “Fiddler on the Roof” became one of the highlights of his post-“Star Trek” career in theater. Leonard also acquired his pilot’s license. In the 1970s, Leonard enjoyed acclaim for projects like “Invasion of the Body Snatchers” and “In Search Of.” When “Star Trek” was turned into an animated series, Leonard held out until producers agreed to hire George Takei and Nichelle Nichols, who were not initially included in the cast. Leonard and Adam’s relationship grew more estranged as Leonard’s career entered a lull and Adam became involved in the Deadhead scene. In order to secure Leonard’s participation in “Star Trek: The Motion Picture,” Paramount settled a lawsuit brought by Leonard for merchandising profits off likeness rights. Leonard attributed that movie’s failure to a disappointing script and focus on special effects over story. Leonard presumed “Star Trek II: The Wrath of Khan” would be his final performance as Spock. Leonard enjoyed a promising directing career after “Star Trek III: The Search for Spock,” “Star Trek IV: The Voyage Home,” and “Three Men and a Baby.” However, professional fortunes reversed when “The Good Mother” was unsuccessful at the box office. Around this time, Nimoy’s alcoholism grew worse, as did his relationship with Adam. In the 1980s, Leonard’s parents died. Leonard’s personal life worsened with the divorce of his first wife and increasing animosity between he and Adam. Leonard’s domestic life improved when he remarried in 1989. Leonard subsequently went into recovery for alcohol addiction. J.J. Abrams, Simon Pegg, Zachary Quinto, and Zoe Saldana discuss working with Leonard on the rebooted “Start Trek” films. Still estranged with his father around 2006, Adam’s personal life grew problematic from a divorce and addiction recovery of his own. When Adam’s second wife was diagnosed with cancer some time later, the situation brought Leonard back into his life and they began repairing their bond. As a conclusion, interviewees describe Leonard and/or Spock using only one word. “For the Love of Spock” was initially conceived to celebrate the character of Spock as part of the then upcoming 50th anniversary of “Star Trek” in 2016. With Leonard Nimoy’s death in 2015, the beloved actor’s filmmaker son Adam Nimoy refocused the project to include more reflections on Leonard as a person, and on their hill and valley relationship as father and son. What comes out in the wash is nothing like a niche cornucopia of Trek-related trivia. Devoted trekkers already know nitty gritty details about things like the “live long and prosper” greeting anyway. That knowledge probably includes familiarity with much of the archival interview footage used, too. Neither is the film a TMZ tell-all. While the existence of warts is peripherally acknowledged, “For the Love of Spock” is vague on whether Leonard Nimoy even had dirty laundry, much less interested in clipping it with clothespins for public consumption. Releasing one year after Nimoy’s death, “For the Love of Spock” couldn’t, and really shouldn’t, be those things. That’s not what his admirers want or need. Instead, “For the Love of Spock” is a tribute. And as a monument to the man Leonard Nimoy, the myth of Mr. Spock, and the legend of how the former’s fact intersects with the latter’s fiction, the film is absolutely on point. The usual suspects of interviewees paint broad strokes of Leonard personally and professionally. Every surviving primary cast member from the original “Star Trek” series is featured, some more than others, as are actors from the reboot films, who provide a boost to contemporary appeal. Adam Nimoy is joined by sister Julie and uncle Mel to offer insight on the family side of things. What’s curious about the profile of Leonard’s history is how many vacancies exist in recaps of his timeline. Leonard’s first wife for instance, is effectively red-shirted, never once identified by name despite being married to Leonard for 32 years and giving birth to the documentary’s director. The professional part of Nimoy’s life sees similarly glaring omissions. “Star Trek III: The Search for Spock” bears the titular character in its subtitle and was Nimoy’s feature film directorial debut. Yet it too is oddly not mentioned directly. The scope of any 83-year-old person’s life, much less Leonard Nimoy’s, is never going to be completely captured in a 105-minute retrospective. Though deleting crucial personalities and major milestones only to include non-sequitur segments such as Kirk/Spock slash fiction seems a misbalance of importance in the documentary’s core concept. Ambiguity extends to Adam Nimoy’s references of friction with his father. As the world saw more of Mr. Spock, Leonard’s children saw less of their father. Discord continued into adulthood for Adam, though specifics of strife between the two Nimoy men is left up in the air. Adam twice mentions “old issues” without detailing what those issues were. Blanks can be filled in somewhat from admissions of addiction on both parts, but more directness about the details would cut the cord of frustration over keeping skeletons hidden so deep in the closet. It’s not about being an exposé. It’s about comprehending the complexities between Leonard and Adam. One could argue that their conflict’s context isn’t anyone else’s business. Another could counter that knowing the background is essential to understanding how they rebuilt their relationship, a prime tenet of the documentary’s throughline. Eyebrow-raising exclusions and occlusions like these would earn different documentaries more unfavorable criticism. The reason they are less detrimental here is because as “For the Love of Spock” progresses, an impression of Leonard Nimoy forms from something much more insightful than empirical numbers and names could ever impart. The audience’s sense of the actor is filtered not through facts but through fondness from how those in his intimate circles perceived him. Anecdotes and remembrances recall Nimoy’s creativity as an artist, his influence as an icon, and the love friends, fans, and family members still hold for him as a human. Try to remain dry-eyed during a replay of the legendary “Wrath of Khan” death scene, now fraught with new subtext related to Nimoy’s own passing. Try not to smile at the story of a once disapproving father proudly hanging a Spock photo in his Boston barber shop, where eager children asked for a “Spock cut” likely without knowing who was taking scissors to their hair. 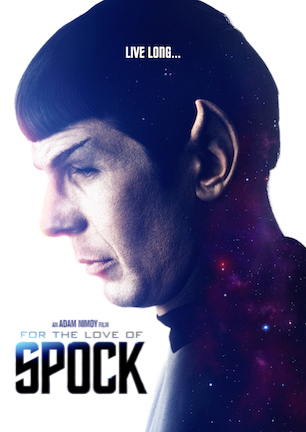 “For the Love of Spock” is honorable and heartwarming without stroking too much sugary sentimentality. Idealistic, perhaps. But the presentation makes a fitting showcase for how Leonard Nimoy ought to be remembered at a time when the world is losing too many of its idols through death or disgrace. It shouldn’t be possible to pull more facts from a celebrity’s Wikipedia page than from a documentary rooted in that person’s life. Such is the case with Leonard Nimoy and “For the Love of Spock,” however. Being unconcerned with fulfilling the function of strict biography, the movie might not be exactly what fans expect. But given the timing of its arrival, the film is precisely the portrait of Nimoy that we all deserve. September 15, 2016 by Ian Sedensky.